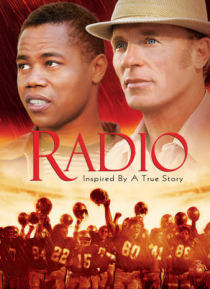 In a racially divided town, coach Jones (Ed Harris) spots a mentally disabled African-American student named Radio (Cuba Gooding Jr.) near his practice field and is inspired to befriend him. Soon, Radio is Jones' loyal assistant, and principal Daniels (Alfre Woodard) happily notes that Radio's self-confidence is skyrocketing. But things start to sour when Jones begins taking guff from fans who fee… l that his devotion to Radio is getting in the way of the team's quest for a championship.